Been having some bad luck, past few trips. LDR (an acronym for long distance release) 5 fish in both Oct and November. Then this trip, not many shots again, but had every permit see the fly, attack the fly but no hook ups. Today, first shot same thing. Second shot landed the permit, but hook was bent, and broke when we tried to fix it. My guide picked one of your flies, and next shot we landed this nice single. Then for my 4th shot of the day, I casted to a push, and landed a nice bonefish on your fly…. I just sent out a few of my Sili-Crabs to a good buddy back east to target permit on the flats. These crabs legs are hand crafted out of a artist woodcut block, sprayed with release and then poured with a fast cure silicon. I can color them silicone pigments or after they cure with water-proof markers. Once the legs are made the rest of the fly is pretty easy to finish. I will try to put up a tying sequence soon. 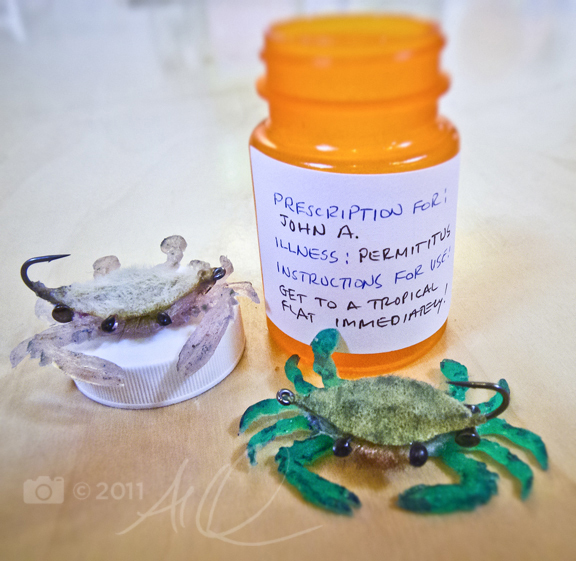 My inspiration for these realistic crabs were the Hiromi crabs which set the bar for crab flies a few years back. Hiromi hand cut the legs for his crabs individually out of rubber gloves. My tend to be a little more production style. When I do the article on these I will show how these can be weighted in various ways.